I got the ideas for this one from a couple of delicious cocktails. 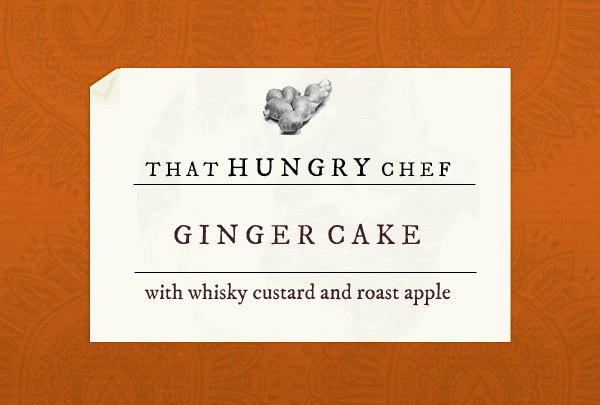 First, the Whisky Mac – whisky with ginger wine. The second, a cocktail with whisky, apple juice and ginger beer. The cake is fantastic just on its own with a cup of tea and all three together make for a warming dessert. Needless to say, this dessert is fantastic with a wee dram like Ardbeg or Lagavulin. In a pan, melt the butter and sugar on low heat. Whisk the eggs for about 5 minutes (ideally with an electric whisk) until they are light and frothy. Sift the baking powder, salt, spices and flour together. Whisk the melted butter into the eggs and then whisk in the flour. Flour or line a large cake tin and pour the batter in. Cook in an oven pre-heated to 160C for 40 minutes. Check with a toothpick or skewer - it should come out clean when inserted into the middle. Put the milk and cream in a pan and bring to a boil. Pour the cream on top of the eggs while whisking continuously. Pour the entire mix back into the pan and cook on very low heat, stirring continuously, for about 5 minutes. The custard should coat the back of a spoon when its ready. The trick is to cook it on a very gentle heat, stirring all the time! Add the whisky and more to taste if you like! Slice the top and bottom off the apple and take the core out. Heat a pan with a little butter and vegetable oil together. Dip the large cut side of the apple in sugar and fry in the pan until golden in colour. Repeat for the other slices. Put the apples, caramel side up, in a baking tray and pour the caramel deglazing liquid over the top. Bake in the oven at 180C for about 10 minutes.